Tonight starts the Jewish festival of Hanukkah, also called the “Festival of Lights”. The tradition is to light candles for 8 days. Hanukkah dates back to two centuries before the beginning of Christianity. In the western calendar Hanukkah is celebrated in November or December. The word Hanukkah means rededication and celebrates one of the greatest miracles in Jewish history. The festival reminds Jews of a time over 2,500 years ago when Antiochus, a Syrian king, tried to make the Jewish people worship Greek gods. A statue of Antiochus was erected in the Jewish temple and the Jews were ordered to bow down before him. The Ten Commandments forbid Jews to worship statues or idols and so they refused. A small group of Jews called Maccabees rebelled, and after a three year war they recaptured Jerusalem from the Syrians. But the temple was all but destroyed. The Jews had to clean and repair the Temple, and when they were finished they rededicated it to God. They did this by lighting the lamp (Menorah) – which was a symbol of God’s presence. Only one small jar of oil was found, enough for one day, but miraculously the lamp stayed alight for eight days. How is Hanukkah celebrated today? Hanukkah is celebrated by lighting one candle on the Hanukiah (an eight-stemmed candelabrum) each day. The Hanukiah symbolises how God looked after the Jewish people at this difficult time. Games are often played at Hanukkah. The most common game uses a dreidel and is a popular way of helping children to remember the great miracle. Hanukkah customs include eating foods fried in oil such as latkes (potato pancakes) and sufganiot (doughnuts). I would like to share with you my own recipe of crispy potato latkes, adapted from one of my favourite chefs, Martha Stewart. Preheat oven to 100 degrees C. Grate potatoes in long strips, using smooth strokes to run potatoes across grater into a large bowl of ice water. Using a strainer or slotted spoon, transfer potatoes, reserving liquid, to another large bowl lined with a clean kitchen towel; gently squeeze dry. Set reserved liquid aside for 10 minutes to allow starch to sink to the bottom; carefully pour liquid from the bowl, reserving milky residue (potato starch) and discard. Transfer potatoes back to bowl with potato starch. Add onions to bowl; stir in eggs, flour, salt, and pepper. Line a baking sheet with paper towels; set aside. In a heavy nonstick skillet, heat around 60 mm of oil. Spoon 2 tbsp of potato mixture per pancake into skillet. Make a few at a time, being careful they don't run into each other. Fry on both sides until golden brown, 4 to 6 minutes. Transfer to prepared baking sheet to drain. Keep warm in oven while preparing the others. Serve hot with applesauce, or sour cream if desired. 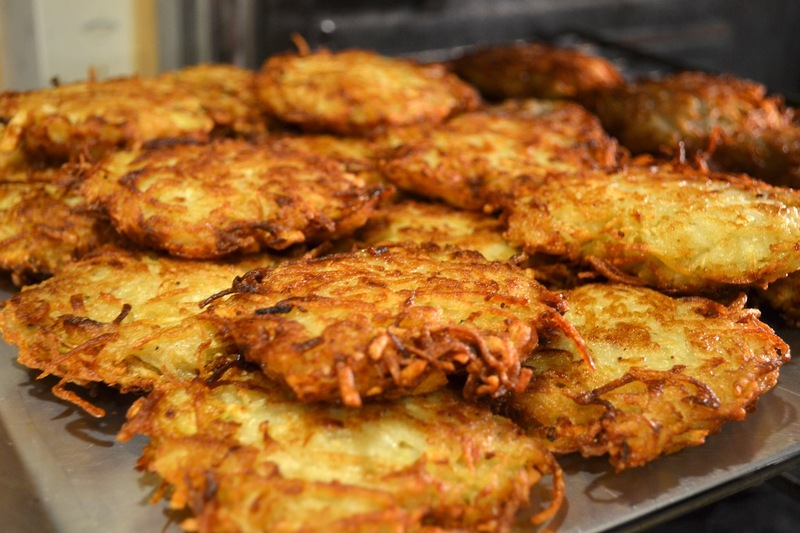 Enjoy your crispy potato latkes and Happy Hanukkah!